They're celebrating "Exotic Meat Month" (their creation by the way) by offering a tarantula burger. Should they finish the burger and their side of fries they win a limited edition T-shirt and have their picture taken for "social media fame and glory". 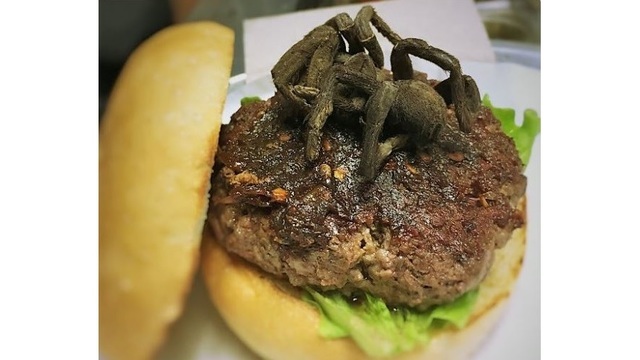 A Durham, North Carolina restaurant is striking fear into the hearts of eaters with a new dish, tarantula burgers. Bull City Burger and Brewery has served one tarantula burger every day since April 4, and the lottery continues through April 29, while supplies lasts. For $30, customers get a 100 percent North Carolina pasture-raised beef burger topped with Gruyère cheese, chili sauce and an oven-roasted tarantula. Other burgers offered at the restaurant this month include alligator, iguana, python, bison, turtle and bugs. Surprisingly, the burger has been so popular the restaurant is holding a raffle to select the "winners" of the burger.